Paperback, with flaps, 208 pages, 13.5 x 21.5 cm, 5.3 x 8.5 in. The mothers of boys will ask themselves many questions, such as "How will I survive the school years with my crazy kids?" and "How will I feel when my little guys grow up into real men?" 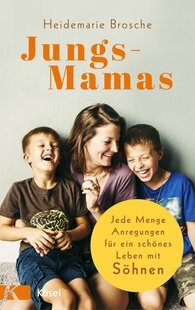 Heidemarie Brosche, mother of three grown sons, knows that positive experiences will develop from the first fears and anxieties, ones that only the mothers of boys can experience.